and Thomas McEvoy, training instructor at I.U.O.E Local 4. 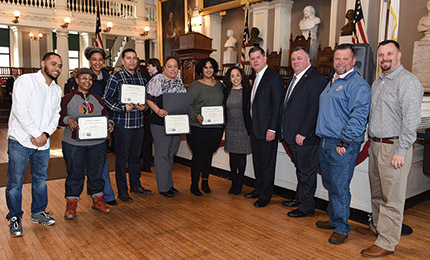 Boston, MA The city of Boston celebrated the first graduates of mayor Martin Walsh’s City Academy training program during a ceremony at historic Faneuil Hall. City Academy is an initiative to provide job training for city residents from underserved communities, allowing them to maximize career opportunities and earn better wages to support their families. The first-ever graduating class of 26 men and women earned a Commercial Driver’s License (CDL) and hoisting certification or completed Emergency Medical Technician training. Building contractor Suffolk, Teamsters Local 25 and I.U.O.E Local 4 were supporting partners, providing expert trainers, mentorship, safety certifications, and industry recognized credentials. Mayor Walsh delivered a keynote address to the graduates, their families and the various partners in attendance, thanking all who helped create these training opportunities and noting that the first City Academy graduating class is a true reflection of the diversity that makes Boston such a wonderful city. Student Aadam Abdul-Musawwir of Roxbury also spoke, thanking the City Academy program and noting the support of Suffolk and Teamsters Local 25, who mentored him throughout the program. The City Academy training program will help low-and middle-income residents access entry-level City positions that offer good pay at or above Boston’s Living Wage, plus benefits, union membership and opportunities for career advancement. It also will help address a local shortage of drivers with CDL training needed to fill a large number of jobs and create more diversity in the workforce. City Academy’s CDL/Hoisting training track includes a job readiness boot camp, site visits to participating City agencies, and training and test preparation leading to a hoisting license and/or CDL. Trainees are able to learn about opportunities in commercial driving and heavy equipment operation at the career showcase held at Suffolk’s newly renovated and expanded headquarters. Tom Morrissey, an instructor with Teamsters Local 25 Training Program and CDL Truck Driving School, leads CDL/hoisting training, as well as an OSHA 10 Safety Training course offered in-kind by Teamsters Local 25. Teamsters Local 25 has seen its students achieve success upon completion of its CDL training school in Tewksbury. Drivers who complete the program attain high-paying jobs that include great benefits and union membership. Local 25 has seen an increase in women participants; more than 20% of Teamster Local 25 CDL training graduates are female, and that percentage is expected to rise. Graduates of City Academy’s CDL/Hoisting training track will be eligible for jobs with the Boston Water & Sewer Commission, the Department of Public Works, the Parks Department, and the Boston Housing Authority. For more information, visit the City Academy website at https://owd.boston.gov/cityacademy.